U.S. Upstream Operations (18% of operating earnings): Chevron explores for, develops, and produces crude oil and natural gas. The firm is also involved in the processing, liquefaction, transportation, and regasification associated with liquefied natural gas. Chevron transports crude and natural gas as well. International Upstream Operations (59% of operating earnings): key production regions include Australia, Nigeria, Thailand, Indonesia, Angola, Bangladesh, and Canada. U.S. Downstream Operations (14% of operating earnings): Chevron owns refineries that use crude oil to make petroleum products such as gasoline, jet fuel, diesel. This segment also supplies thousands of gas stations operating under the Chevron and Texaco brands and markets petrochemicals such as plastics and lubricants. In 2018 Chevron's total production grew about 6%, excluding asset sales, to reach approximately 2.9 million oil-equivalent barrels per day (bpd). Growth is being driven by increased U.S. shale production and Australian liquefied natural gas opportunities. Chevron is one of just three dividend aristocrats in the energy sector, having raised its dividend for 31 consecutive years. The company has also paid dividends every year since 1912 (107 years). It's rare for a cyclical oil & gas company to achieve dividend aristocrat status, which requires at least 25 consecutive years of rising payouts. However, Chevron has managed to reward investors with more than 30 consecutive annual dividend increases thanks to several competitive advantages. These include being extremely large and diversified, with significant operations all over the world. As a result, in its upstream business Chevron can focus on minimizing its production costs, while raising production rates and growing its earnings and cash flow over time. Chevron's global downstream businesses also help smooth out the inherent ups and downs of the industry's business cycle because refining and petrochemical margins tend to rise when oil prices fall (lower oil prices hurt profits in the upstream business). Another key to Chevron's long-term success is the quality of its management team. Chevron has consistently proven adept at making wise capital allocation decisions, including demonstrating a strong ability to cut costs during downturns and take a disciplined approach to dividend growth. For example, during the oil crash that began in late 2014 (when U.S. oil prices peaked at over $100 per barrel versus $54 today), the company has managed to slash its exploration, production, and administrative costs by 20% to more than 50%. In addition, the company has refocused its much smaller capital spending budget on more profitable growth projects, about 75% of which are expected to start generating cash flow within two years of construction starting, and almost 90% of which are focused on upstream production growth. Even with the firm's continued modest spending, Chevron believes it can deliver steady annual production growth of around 5.5% through 2020. That's not a small feat given that the company's production levels are already among the highest of any energy producer in the world. To illustrate just how efficient Chevron is, it's worth nothing that the firm's cost-cutting efforts still allowed it to maintain steady oil production volumes over the years while consistently growing its reserve base. You can see that Chevron's reserves-to-production ratio, which measures how many years of production the company has left based on its current proved reserves and production rate, has remained steady near 12 years while the other oil majors have seen a downtrend. Chevron also continues to maintain one of the highest resource bases relative to its production rate. Now that oil prices have recovered and its production is growing thanks to U.S. shale, Chevron's cash flows are booming. That's largely due to its focus on oil-linked production (75% of its total liquids production), which carries higher margins compared to natural gas. Chevron plans to keep lowering its production costs even more, despite the recovery in oil prices. Thanks to new advances in drilling technology, management believe it can take Chevron's average production costs down 50% from about $18 per barrel in 2014 (pre-oil crash) to less than $10 per barrel by 2020. Thanks to its efficiency initiatives in recent years, management says Chevron's breakeven price for its dividend, meaning the global oil price at which operating cash flow covers capex and the dividend, excluding asset sales, is just $50 per barrel. For each $1 per barrel increase in the price of global oil, Chevron estimates its free cash flow rises by $450 million per year, providing additional safety and growth potential should the long-term price of oil head higher. Besides keeping costs low, Chevron's ability to sustain necessary investments and maintain its dividend, especially during oil crashes, is aided by its strong balance sheet. As you can see, Chevron is right up there with Exxon in terms of earning an excellent credit rating and limiting its use of leverage. This provides the firm with flexibility to borrow during periods of low oil prices when profits shrink, and then pay down debt when oil prices recover and it generates significant free cash flow. 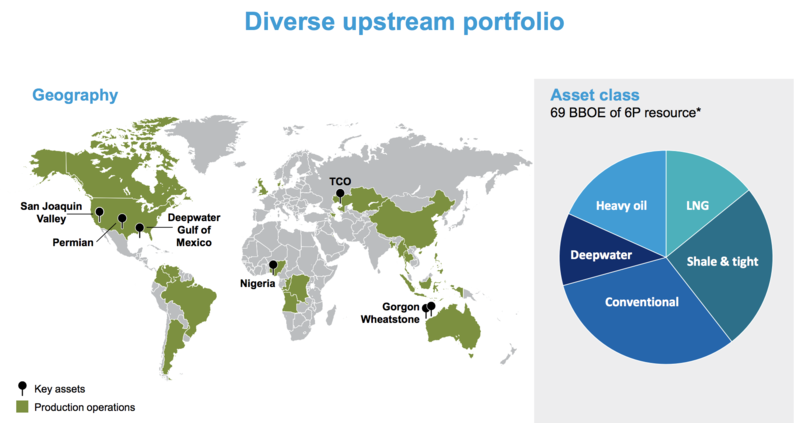 Chevron periodically reinforces its balance sheet strength by optimizing its asset portfolio. For example, between 2018 and 2020 the company plans to record $5 billion to $10 billion in non-core asset sales, mostly focused on its less profitable operations in the U.K. Central North Sea and Denmark. Besides being used for debt reduction, asset sale proceeds help fund investments in key growth priorities like the Permian basin. Chevron's resources in this fast-growing region grew 20% over the past year to reach 11.2 billion oil-equivalent barrels, representing 16% of the company's total resources. As development and production costs continue falling, Chevron expects its assets in Permian basin to be a key business driver in the years ahead. 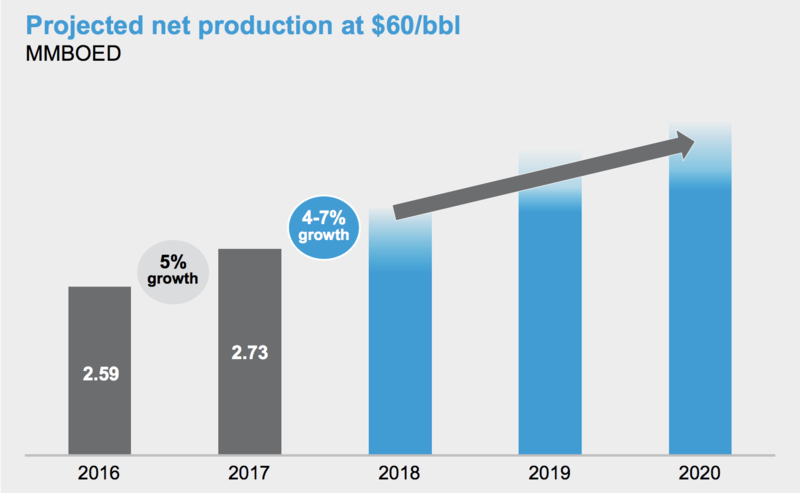 In fact, by 2022 Chevron believes its production from the Permian shale formation alone will rise to 650,000 bpd (up from about 100,000 bpd in 2015), representing about 20% of its projected daily production at that time. 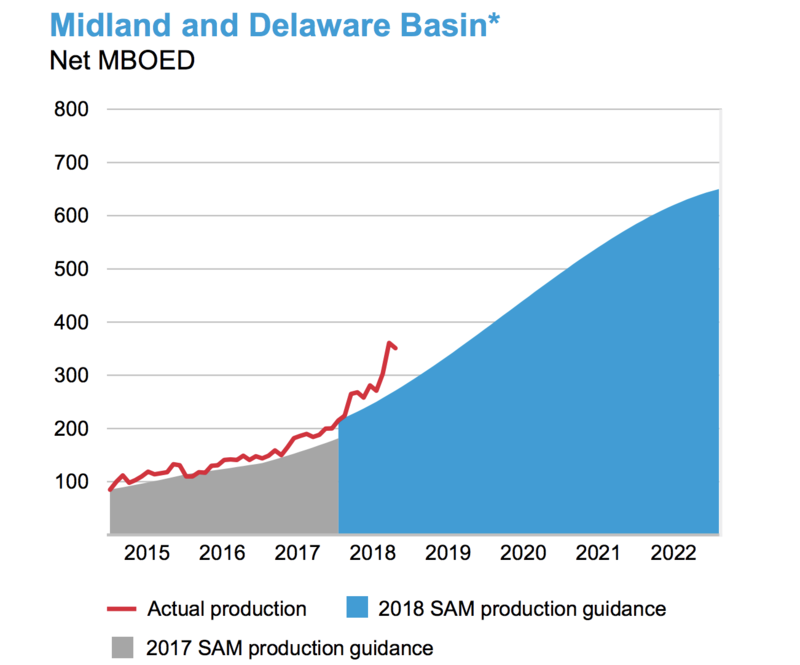 And as you can see, the favorable geological characteristics of the Permian (which the Midland and Delaware basin is part of) has allowed the company to consistently exceed its production guidance over the years. However, Chevron isn't just betting its future on U.S. shale. The firm has also been investing in the Gorgon and Wheatstone LNG (liquefied natural gas) export terminals in Australia, which were completed in 2018. Together these two projects are expected to provide about 400,000 bpd of oil-equivalent production (13% of the company's total current levels). 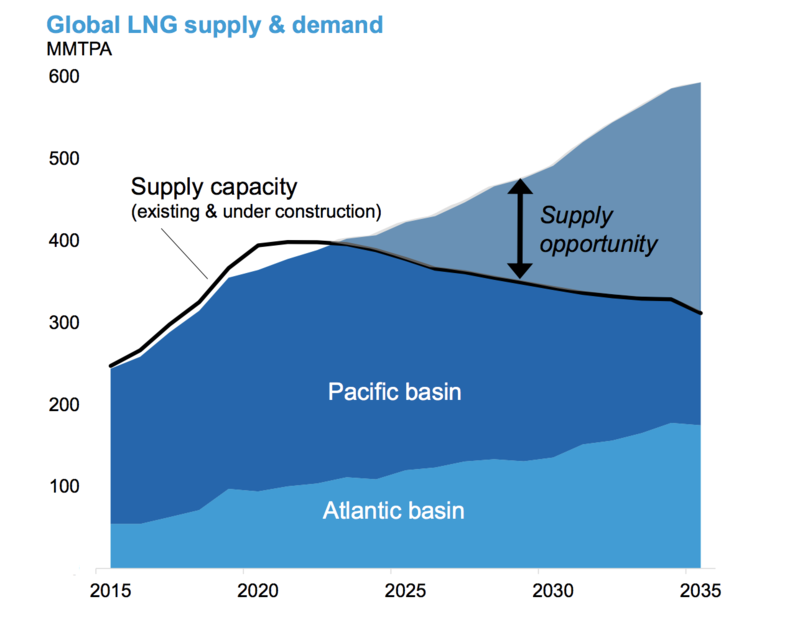 Thanks to relatively fast growth in emerging (and highly polluted) economies like China and India, LNG demand is expected to rise steadily for decades. Currently the oil & gas industry is not spending enough to meet this demand. As a result, LNG is a key area that Chevron plans to target with its focused capex budget in the years ahead. The vast majority of Chevron's LNG exports are under long-term contracts and require very little maintenance each year to maintain steady production levels, further increasing their appeal. Overall, Chevron appears to be one of the best-run integrated oil companies in the world, with a conservative corporate culture focused on safe and growing dividends, disciplined capital allocation (return on capital employed estimated to reach around 15% by 2020), and a strong balance sheet to protect it during the industry's unpredictable ups and downs. However, as with all investments, there are still some risks to keep in mind. While Chevron has proven itself to be one of the most shareholder-friendly oil companies in the world, there are still various risks that all oil companies face. First and foremost is the fact that their ultimate products – oil, gas, refined products, and petrochemicals – are all commodities. This means their prices are set in international markets, so any oil company's revenue, earnings, and cash flow are ultimately at the mercy of volatile commodity cycles that management has essentially no control over. Commodity prices can crash in a hurry as well, providing management will little time to prepare. The price of oil plunged 70% in less than eight months during the financial crisis, for example. And from October 2018 through December 2018, crude tumbled 45%. The most recent oil crash was one of the fastest and sharpest in decades, with crude prices nearly cut in half in less than three months. This shocked even veteran industry analysts, many of whom just months before had forecasted oil prices could rise to $100 per barrel or more due to Iranian sanctions. This highlights how hard it is for anyone to accurately forecast crude prices over the short term. Unfortunately, long-term forecasts are also merely educated guesses as well. Chevron's capital-intensive investments in U.S. shale, LNG exports, and others require many years of solid cash flow to earn healthy returns. When making these long-term capital allocation decisions, management must forecast oil & gas supply and demand many years out. 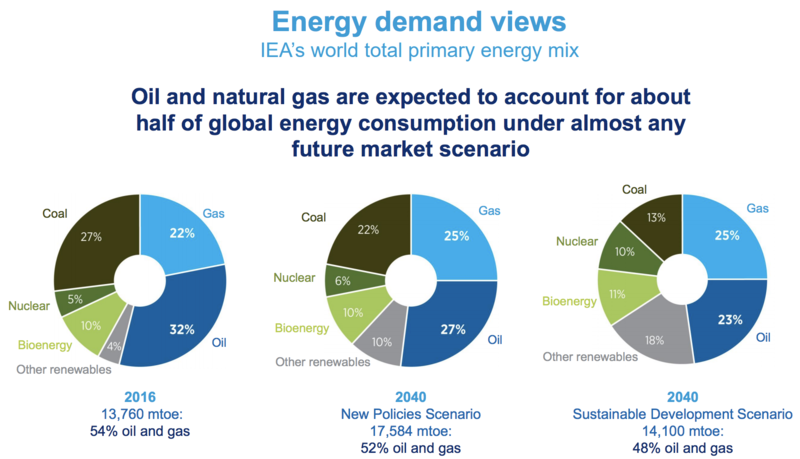 Chevron relies on its proprietary models as well as key industry forecasts like this one from the International Energy Agency (IEA). Current IEA estimates call for oil & gas to remain the primary source of world energy in 2040, even if the world's countries achieve their Paris Climate Accord targets (most are currently far behind their targets). The oil industry expects demand for its key products to remain strong and in grow steadily, though slowly, over time. It's hard to say what the global energy landscape will look like in 10 years, much less in 2040. However, should solar, wind, and energy storage technologies continue becoming more affordable, it's possible they disrupt oil and gas demand faster than management and industry analysts expect. Solar and wind will account for 80% of new energy capacity. Gas demand will grow at 1.4% per year and oil at 0.4% annually, but overall fossil fuel market share will fall from 82% of all energy use today to 74%. The petrochemical industry will account for 70% of oil demand growth. By 2030, 50% of new cars sold in China, the European Union, and the United States could be partially or fully electric (30% worldwide). Overall global oil demand could peak in 2030. While your forecast of the global energy industry's future is as good as mine, the point is that even great oil companies, like Chevron, have to make long-term investment plans with limited and changing information. Combined with the potential for cost overruns, project delays, a global recession causing another oil crash, or a surge in renewable energy adoption, the firm's outlook for short- and long-term profitable growth can and will continue fluctuating, even if its dividend continues to remain on solid ground as expected. The oil & gas industry, especially the upstream component, is hardly conducive to reliable dividends. The capital-intensive nature of the business and inherent volatility of commodity prices make it difficult for most energy companies to be able to commit to a consistent and growing dividend. Yet for more than a century Chevron has proven itself capable of navigating this industry's booms and busts, helped by its conservative management team, scale advantages (break-even point for cash flow after dividends is just $50 per barrel), and integrated business model. These factors have allowed it to become one of just three dividend aristocrats in the energy sector (Exxon Mobil and Helmerich & Payne are the others). However, because of the inherent ups and downs built into the business model, oil companies are generally more appropriate for risk-tolerant investors since they tend to have volatile share prices. Furthermore, any investor considering energy companies needs to be mindful about when to purchase shares, with a preference toward investing in the strongest players during an industry downturn. If you are comfortable with its risk profile and the volatile nature of its share price, Chevron appears to be one of the few dividend stocks worth considering as a long-term income investment in the energy sector, along with Exxon Mobil.